We recently happened upon a pair of nicely restored, early-sixties Oldsmobile hardtops. Oldsmobiles of this vintage aren’t necessarily rare or unusual, but what intrigued us was the fact that one was a 1960 and the other a 1961, giving us a rare opportunity to compare the 1960 and 1961 Oldsmobile years side by side and to consider that long-standing automotive custom, the annual model change. Every summer for the past 80-odd years, automakers have released a swarm of press releases and announcements about their exciting new fall models. Each year’s crop of cars is supposedly new and improved, and every so often, they’re even alleged to be all new. All this hype, of course, is supposed to spur you to buy a new model by making your old car suddenly seem obsolete. It was commonplace even in the early days of the auto industry for automakers to roll out new wares every fall. Many did so reluctantly; most automakers were founded by engineers who chafed at having to redesign their products for anything as trivial as fashion. Even so, they were aware that cars were luxury goods, bought by moneyed classes that were accustomed to having the latest of everything. Furthermore, technology was evolving so rapidly that it was not at all impossible for a model to become genuinely obsolete in only a year. Henry Ford wanted none of this. Henry had been a farmer before he started making cars, and he saw the automobile as a tool, like a shovel or a tractor. The epitome of his philosophy, the Model T, was intended as a simple, utilitarian design that could be gradually perfected, allowing it to be produced for ever-lower prices. That isn’t to say the Model T didn’t undergo visual and mechanical changes over its long history, but they were not readily apparent. They were certainly not enough to make you want to rush out and buy another Ford, unless you had just wrapped the previous one around a tree. After all, you don’t buy another shovel just because the new ones have different-colored handles. Since Ford dominated the auto market in the 1910s and early 1920s, other automakers followed his lead for a number of years. It wasn’t until 1923, shortly after our old pal Alfred P. Sloan became president of General Motors, that the annual model change once again reared its gaudily colored head. GM’s 1923 annual report was actually apologetic about it, although the practice would prove highly lucrative in the years to come. Alfred Sloan felt that treating cars as durable goods — appliances to be replaced only when the old one wears out — was a waste of profit potential. If your product never really changes, repeat customers are few and far between. To encourage buyers to return more frequently, Sloan proposed that each year’s new model should be more exciting and more attractive than the last, to make customers dissatisfied with their current cars. It was a strategy that later became known as planned obsolescence. Sloan’s ideas really took flight in 1927, when he hired Harley J. Earl to head the new Art & Colour section. Earl’s team of stylists and designers would create a new look for each year’s cars. The annual facelifts were expensive, but they kept buyers interested, and made the competition scramble to keep up. Restyling was also a lot cheaper than genuine technological innovation, about which Sloan was dubious. Sloan felt it was important to maintain parity with the competition, but he considered true novelty to be a risky gamble. By the 1950s, GM had refined this process to a high art, forcing its competitors to follow suit. Each summer’s rollout of the new models had the same fervor and manufactured excitement that today accompanies the release of blockbuster summer movies. Even people who weren’t in the market for a new car would often stop by the local dealership for the dramatic unveiling of the new models. GM, never one to do things small, added to the enthusiasm by staging its own traveling auto show, the Motorama, which whetted the public’s appetite with gleaming prototypes and wild-looking concept designs. 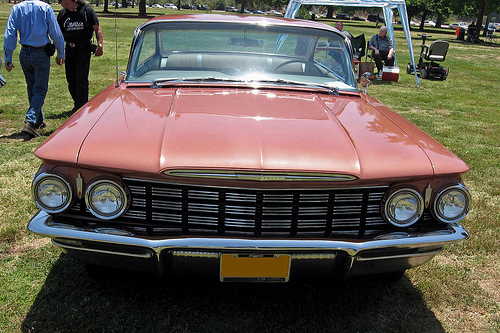 The 1961 Oldsmobile Super 88’s sunken grille treatment and slightly pointed bumper (bottom) contrive to make the nose look longer than it actually is, disguising the reduced front overhang. 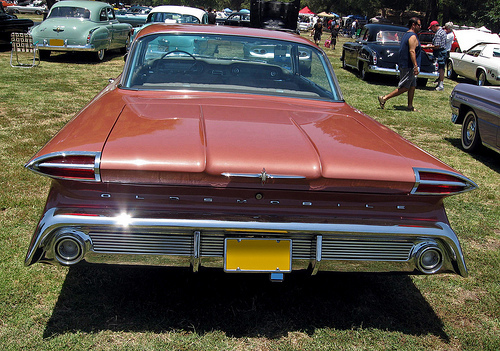 The fin-like projections on either corner of the bumper also make the 1961 Oldsmobile’s front end look lower; although the hood line is indeed lower, bumper height is actually about the same as on the 1960 Oldsmobile 98 (top). Let’s compare a typical “all-new” model to its immediate predecessor, and see how much has actually changed. Oldsmobiles of the late fifties and early sixties are admittedly not very interesting or exciting cars, but they defined the middle of the middle class, which makes them an excellent example. The restyling of the 1961 Oldsmobile did have some practical benefits aside from its smaller dimensions. In the 1960 Oldsmobile, it’s impossible to see the edges of the fenders over the broad, sloping hood; the 1961 car’s vertical fender blades are visible to the driver, making the car much easier to park. 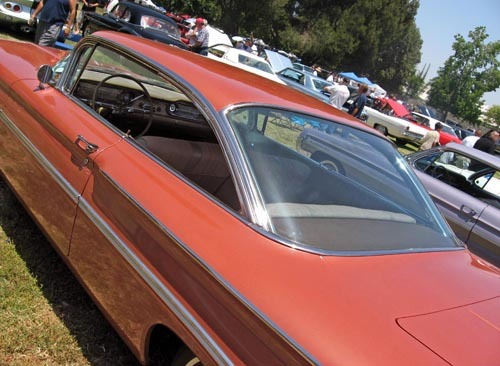 The 1961 Oldsmobile’s windshield, meanwhile, no longer wraps around, eliminating the 1960 car’s obnoxious “dogleg” A-pillars and making it much easier to climb in or out without bashing your knees. As you can see, the two cars do look significantly different. Nevertheless, they still share the same body shell: GM’s corporate “B-body,” also used by contemporary Chevrolets, Pontiacs, and Buicks. Unusually for this era, the 1961 Oldsmobile was actually somewhat smaller than the 1960 Olds rather than the other way around. The wheelbases remain the same, but the 1961 car’s front and rear overhang have been trimmed a bit, cutting 5.6 inches (142 mm) off its overall length. 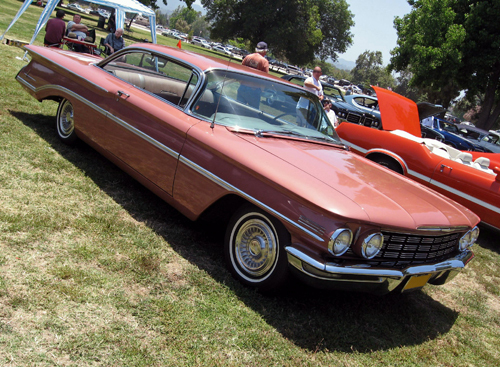 (The difference here is more pronounced because the orange car is a 1960 Oldsmobile 98, which rode a 126.3-inch (3,208mm) wheelbase, 3.3 inches (84 mm) longer than the wheelbase of the 88 and Super 88.) The 1961 Oldsmobile is also 3.4 inches (86 mm) narrower than the 1960, thanks mostly to the elimination of the broad horizontal fender peaks. 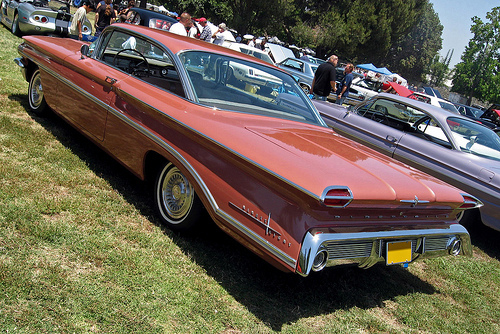 The roof lines of both cars look similar, but the 1961 Olds tones down its predecessor’s wraparound windshield and is fractionally lower. Under the skin, the 1961 Oldsmobile has a different frame. The 1960 Oldsmobile’s “Guard Beam” chassis is a perimeter frame with diagonal bracing; although it was ostensibly new for 1959, it was basically the same design Olds had used since the mid-1930s. The 1961 Olds chassis is still a ladder-type perimeter frame, but Oldsmobile engineers decided the diagonal bracing wasn’t worth the extra weight. Deleting it made the frame more flexible, but saved around 70 pounds (32 kg). The front suspensions of the two cars are nearly identical, but their rear suspensions are not. The 1960 Olds, like almost all previous Oldsmobiles, has Hotchkiss drive in the rear: a live axle carried on parallel leaf springs. The 1961 Oldsmobile still has a live axle, but it’s now carried by four trailing arms. The leaf springs have been replaced with coil springs, intended to give an even softer ride. Both cars have the same brakes introduced in 1959, cast-iron drums with a big flange on the rim that’s supposed to channel cooling air over the brake surface. 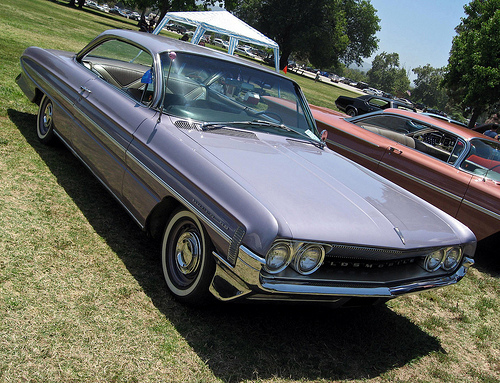 The copper car is a 1960 Oldsmobile 98, while the purple car is a 1961 Oldsmobile Super 88; both are two-door pillarless hardtop coupes. Through 1960, Oldsmobile called this body style the “Holiday SceniCoupe,” but for 1961, it was officially dubbed simply “Holiday coupe.” Oldsmobiles of this vintage offered a choice of three series (Dynamic 88, Super 88, and 98) and seven body styles, giving a choice of 17 different models. 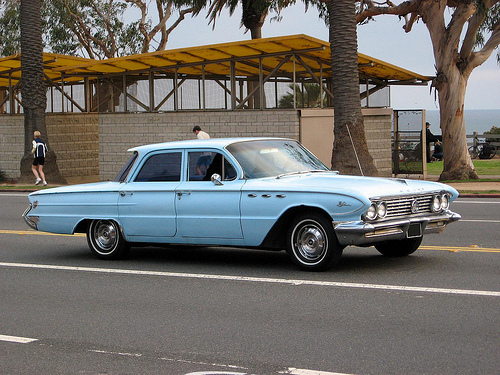 1961 prices were unchanged from 1960; base price of a Super 88 coupe was $3,325, while the 98 was $4,083. Both cars have the same engine, which is essentially a refined version of the Rocket V8 introduced back in 1949. Throughout the fifties, it was gradually expanded from 304 cu. in. (4,977 cc) to 394 cu. in. (6,460 cc) with commensurate increases in power. The 1960 Oldsmobile engine was rated at 315 gross horsepower (235 kW), while the 1961 claimed 325 hp (242 kW) thanks to a slightly higher compression ratio. Neither is really as powerful as the rating suggests. Both are also handicapped by rather tall axle ratios, which keep them loafing at low RPM in the hopes of better fuel economy. Both of these cars, like most (if not all) Oldsmobiles of this vintage, have the optional automatic transmission. The standard gearbox was theoretically a three-speed manual of rather rustic, prewar vintage, but very few of these were actually sold, even though the automatic cost a hefty $230 extra. Confusingly, the transmissions in both cars are called Hydra-Matic, but they are not the same transmission, nor are they the same as the original Hydra-Matic introduced back in 1940. The 1960 Oldsmobile 98 uses the four-speed, dual-coupling Hydramatic, introduced in 1956 and shared by Pontiac and Cadillac. The dual-coupling Hydramatic was far more flexible than many two- and three-speed rivals, but it was bulky, enormously complicated, and expensive to produce. The 1961 Oldsmobile uses the new, greatly simplified Roto Hydra-Matic. Although the newer transmission has only three speeds, it uses a torque converter in place of the four-speed’s fluid coupling, giving the effect of an additional gear at very low speeds. The Roto Hydra-Matic (often called “Slim Jim” because of its smaller case) was 75 pounds (34 kg) lighter than its predecessor and a lot cheaper to produce. Unfortunately, it wasn’t very efficient and it had a propensity for fluid leaks, so it was not necessarily an improvement. 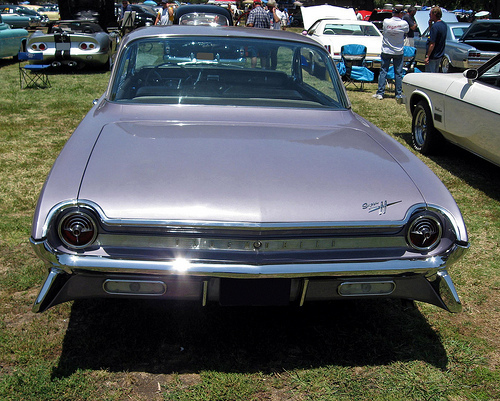 While the front end of the 1961 Oldsmobile contrives to look longer than before, the curved rear fenders make the rear overhang look even shorter than it is, although it is somewhat reduced from the 1960 Oldsmobile. Note how much the elimination of the 1960’s side spear and a slight reshaping of the rear wheelhouse changes the appearance of the side profile, even ignoring the 1961 cars’ different fender tips. 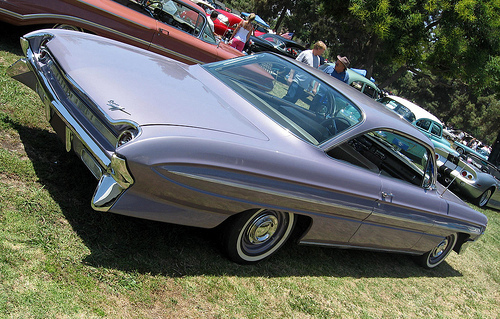 The pointed rear fenders of the 1961 Oldsmobile also echo the front fenders of the contemporary Buick, which shared the same body shell, albeit with a different chassis and engines. In this era, the different divisions were well-differentiated, something that would fall by the wayside in the 1970s and 1980s. We unfortunately do not have good pictures of the interiors of these cars, but the dashboard styling has changed significantly, as have interior trim and upholstery. Both dashboards are functionally the same, with a broad, horizontal speedometer and warning lights for water temperature, battery, and oil pressure. 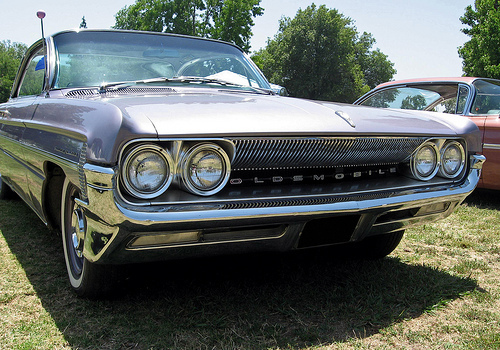 The 1961 Oldsmobile abandons the 1960 car’s symmetrical, twin-cove design and has slightly less chrome, although both cars still have enough interior brightwork to be obnoxious on sunny days. Both cars have power steering, power brakes, and power windows, all of which were extra-cost options. How different are these cars, really? Despite the suspension and chassis changes, they ride and handle much the same — “softly” and “clumsily,” respectively — and their performance is very similar. Commendably, the 1961 Oldsmobile is around 200 pounds lighter than the 1960 Olds, but the more sluggish new transmission makes it little faster. Fuel economy still hovers below 14 mpg (about 17 L/100 km) and both cars’ engines tend to sulk on anything less than 98 RON super-premium gasoline. On the plus side, the 1961 Oldsmobile is easier to park, mostly because the new styling makes it possible to see the edges of the fenders from behind the wheel. Eliminating the wraparound windshield also makes it easier to get in and out; four-door models had wider rear doors, too. Whatever the press releases and zealous salesmen might have claimed, there’s otherwise not much to choose between them other than styling. From the rear, you can see how the 1961 Oldsmobile ended up being 3.4 inches (86 mm) narrower than the 1960 Olds it replaced. The difference comes mostly from the elimination of the funky horizontal rear fenders, which make the 1960 Oldsmobile look like something from The Jetsons. Note that the bumper structure looks to be essentially the same on both cars, even though the detailing is quite different. So, what was the point? The revamp was expensive — we have no figures, but based on other contemporary redesigns, it must have been over $100 million — and didn’t necessarily result in higher sales. Oldsmobile’s volume actually dropped from 347,000 in 1960 to 318,000 in 1961, despite the revamp and the simultaneous launch of the new F-85 compact. To add insult to injury, by this time social critics had become very harsh on the practice of annual model changes, and on planned obsolescence in general. 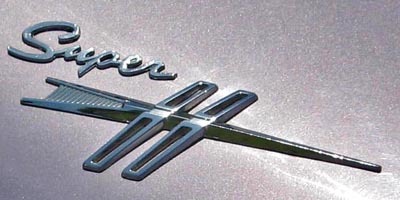 Social critics like Vance Packard derided it, while Volkswagen made fun of it, helping to cement the Beetle’s status as a counterculture symbol. By the late 1960s, even the automotive press — which had profited greatly from publicizing the yearly model introductions — was clamoring for Detroit to give it up. Even so, it took the pressures of government regulation to dim the enthusiasm for the annual model change. Emissions and safety certification for new designs is expensive and time-consuming, and most automakers now approach it in four- and five-year cycles. Even then, stylistic changes are often conservative, as manufacturers strive to preserve brand identity and resale values. Ironically, GM, which had once led the parade of frequent makeovers, has become one of the most conservative, often allowing familiar products to languish for years with only the most minimal improvements. There’s something to be said for keeping costs low and avoiding change for the sake of change, but such neglect has often left GM cars uncompetitive with newer rivals. If the new model introductions are no longer as exciting as they once were, they’ve proven to be a hard habit to break (as the covers of next month’s car magazines will no doubt remind us). Planned obsolescence is much like nuclear “brinksmanship” — it can only end when both sides agree to walk away from the table simultaneously. Until that happens, it remains a very expensive game that no one can afford to win, and nobody dares to lose. 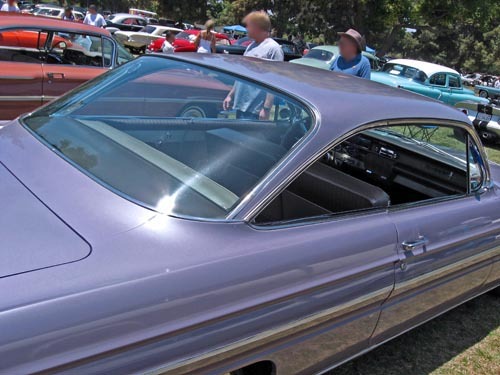 Tom Pelletier, the former owner of the purple 1961 Oldsmobile Super 88 pictured in this article, would love to connect with the car’s current owners. If you know anything about this specific car, please send us a note using the contact form and we’ll put you you in touch with Tom. Our sources for this article included Auto Editors of Consumer Guide, Encyclopedia of American Cars: Over 65 Years of Automotive History (Lincolnwood, IL: Publications International, 1996); Helen Jones Earley and James R. Walkinshaw, Setting the Pace: Oldsmobile’s First 100 Years (Lansing, MI: Oldsmobile Division of General Motors Corporation, 1996); John Gunnell, ed., Standard Catalog of American Cars 1946-1975, Rev. 4th Edition (Iola, WI: Krause Publications, 2002); Leon Mandel, American Cars: From Harrah’s Automobile Collection (New York: Stewart, Tabori & Chang, Inc., 1982); and Alfred P. Sloan with John McDonald, My Years with General Motors (Garden City, NY: Doubleday, 1964). We also consulted the following period road tests: “Oldsmobile for ’59,” Motor Trend November 1958; “Oldsmobile Road Test: Luxury is the selling point but girth is the failing point,” Motor Life February 1959; Ray Brock, “Olds…’59 Class Leader,” Hot Rod June 1959; “Oldsmobile 1960,” Motor Trend November 1959; Ray Brock, “Olds 88 for ’60,” Hot Rod January 1960; “Oldsmobile: not the rocket it used to be,” Motor Life March 1960; and “1961 Oldsmobile Analysis,” Motor Life November 1960, all of which are reprinted in Oldsmobile Automobiles 1955-1963, ed. R.M. Clarke (Cobham, England: Brooklands Books Ltd., ca. 1989). With lots of changes every year, it makes us confused when trying to identify a GM car, or a Chrysler or Ford. On the good side, planned obsolescence makes every car unique. Both these 60 and 61 Olds cars are pretty looking. GM was so good at this, every of the Olds in 1959 to mid 1960s looked good. An Olds could look like a rocket ship because of the exhaust – like tail lights, a Buick looking like a jet because of the fake scoops on the fenders, a Chevy, a plain vanilla ice cream..
…and a Pontiac looking like a wild animal, [ instead of an Indian, ] because of the separated grill nose; I just don’t why I thought of that. This was my first car…not this model,… this exact one! I know the license plate, AWU 732. I would love to find the owner and give him the history of the car, old photos of it, etc. Who knows, many I could even buy it back someday! Any help would be greatly appreciated,thanks! That’s remarkable. I’m afraid I don’t know the owner, and didn’t see him/her. I saw these cars at the All-GM Vehicle Show at Woodley Park in Van Nuys, California last summer, and the best I can suggest is that they’ll likely be there again this year. If I should happen to spot it, I’ll give them my card, and see if I can hook you up. The pitch was that the car was so good and ahead of its time that it didn’t need annual revamps just for the sake of them. Volkswagen advertising in the same time frame emphasised that although their car was continuously refined and updated they didn’t need to restyle it. Checker used the tag line “Being practical is never out of style”. Robert the 1960 Oldsmobile Super 88 and 98’s had the 394 V8 with a 4bbl from the factory. The regular base 88’s had a 371 cid V8 with a 2 bbl. If you had a Super 88 with a 2 bbl it was likely changed. Love my 1960 olds 98. Had one 1965 but sold it when went into Navy. Got another one in 1999. Its a 4 door with 94 thousand miles. I love it.